Pictured below is the 7-Pole RV Umbilical Connector, also called the 7 pole flat-pin plug, which is the connector style most commonly used on RV travel trailers and fifth wheels This connector is made by many companies but they are supposed to be interchangeable and the wiring color code is observed among the various brands. Note that the trucking industry uses a very similar connector. However the pins are round instead of flat so are not compatible with the RV type. As you can see in the illustrations below the back side of the connector body is labeled at each terminal. The labels are listed below with the function assigned to that pin. When wiring the tow vehicle connector… with the exception of 96-98 Ford and Dodge pickups and SUV’s with factory installed trailer wiring… wire color alone should not be relied on, always test and match the function to the appropriate terminal. 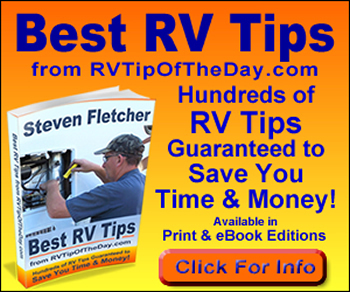 Most RV travel trailers are wired to match the 7 pole plug connector colors but they should be tested when replacing a connector to be sure the function matches the terminal. It should be noted below that the center terminal is labeled as an auxiliary circuit but is most commonly used for backup lights not as a ground terminal as many try to use it. NOTE: #7 is the center terminal and is most commonly used for backup lights.